The following are some thoughts which will hopefully be of some use to two different groups of people: breeders wishing to place their puppies in the best possible homes, and also for helping puppy buyers when selecting their new pet. Dogs communicate mainly through body language – they certainly don’t have an advanced vocal language like humans do. Place two pups in the same home and they will “talk” to each other and zone out the humans. Imagine having twins who go through school together – in the same class, then home to the same house every day. I’ve known twins who have developed their own language and use it to communicate with each other, rather than taking the trouble to learn English so as to be able to speak to their colleagues. Rather anti-social behaviour, and not good for the development of either. Puppies need a lot of attention and socialisation. The most important time for this is before the age of 14 weeks. If you have two litter mates living together, it is very difficult for the owner to spend enough quality time with each puppy individually. Two pups from the same litter will very soon sort out who’s the leader and who’s the follower. This results in what is termed a “shadow dog”. This means that one dog emerges as a leader, and the other always follows in its’ shadow. This is not good for either puppy, as the situation in unnatural and both will feel insecure if the other is not present. If one puppy learns a bad habit (pulling washing from the line, digging holes, barking, etc.) the other will soon join in. Double trouble is not easy to curtail. House training is also much more difficult. How do you know which puppy had the mishap? And the more upset or irritated you get, the more anxious the pups will get and the greater the possibility that accidents will occur. 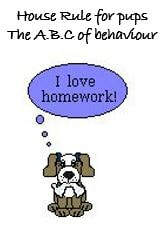 (remember, the puppy will pick up on your emotion – but it is very unlikely that it will understand why you are upset. This is extremely stressful for the animal). Siblings that are kept together whilst growing up form a pack. This can be very unpleasant for others in the family. And it can be a problem if you have a friends’ dog around to play. 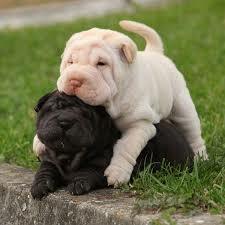 The sibling puppies will often pack up on it and bully it mercilessly. It is much harder to develop a relationship with a puppy if it is left with its’ litter mate for hours on end. So if you want to compete with your puppy, either select only one, or separate them from the moment you get them home. Spend a lot of one-on-one time with each of them. Teaching your puppy its’ name also becomes a problem. One tends to call them together. E.g. “Freda and Fido, come”. They probably each think that their name is “FredaandFido”. Not easy for the pup. Making them once again realise that it is easier to stick to communicating with each other rather than letting a human in. In is much easier to feed both puppies at the same time, in the same place. This can make it much more difficult for the owner to know if one of the puppies is off colour. (one of the first signs of illness being lack of appetite). People who ask to take two puppies from the same litter are often lazy. They want two puppies so that they don’t have to take the trouble of keeping the puppy stimulated and entertained. They rely on the other puppy to do this, often with huge toxic side effects. Two puppies means twice the cost – of inoculations, feeding, sterilizing, etc. Can the owner afford this? It is not uncommon for a male puppy to cover its sister when she first comes in to season. You can just imagine the repercussions of this!! 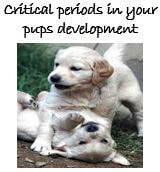 Understanding what is going on with your pup psychologically as it goes through the many stages will help you to 'grow' a well balanced member of your family. Just as we need 'house rules' for our kids having them in place for your pup builds a solid foundation of what will, and will not be allowed. These are all based on the manner in which dogs interact with one another and help a pup to feel secure.